Arlene was born to Frank and Olga (Ecker) Boldt on the prairie of South Dakota near the town of Huron, on September 6, 1922. She was the second oldest child and spent the first ten years living, playing, and working with her siblings Everett, Maxine, Bob, Belva, Larry, and Glen. The years in South Dakota were hard. Drought, the Dust Bowl and finally the Depression took its toll. In 1932, the family packed up everything they could, and with the help of Arlene’s mother’s relatives from Wisconsin they began the journey east, while her brother Everett walked their herd of cows to the train in Huron for the move to a small farm near Baldwin, Wisconsin. Many of Arlene’s relatives still live there today. Times got better for the family and a successful dairy farm grew while they worked very hard, yet also made time to fish and play in nearby Pine Lake. Arlene graduated from Baldwin High School in 1940 and moved to St. Paul, Minnesota to attend Beauty College. 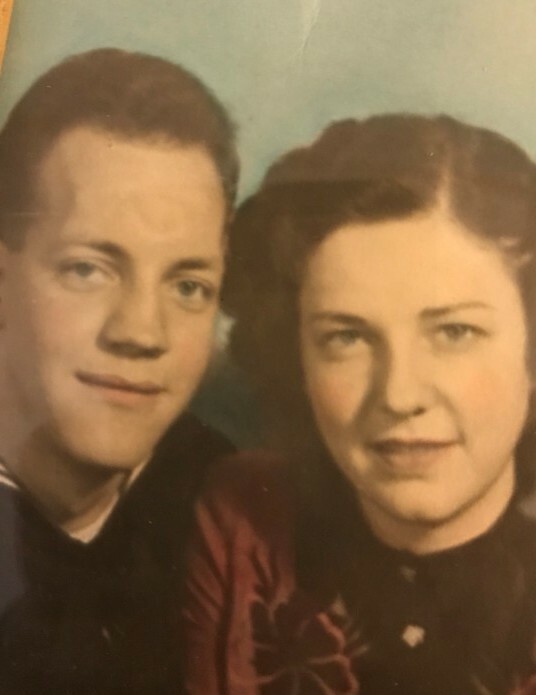 It was there that she met and married a handsome sailor from Grand Rapids, Michigan, Fred (Pete) Ortman, who was attending Great Lakes Naval School. After the war, they moved to Fred’s home town of Grand Rapids, MI, where Arlene began working for Dodgson Hair Salons, and soon after that began raising their three children, Linda, Jack, and Bruce, on the northeast side of town. Along with the full-time job of raising kids, she enjoyed coffee clutches with the Sinclair neighborhood ladies, playing cards, and camping. In 1970 Arlene and Fred built a cottage on Pentwater Lake. Every weekend was spent there working, playing, fishing, having picnics at the State Park or just sitting on the front porch with the kids and grandkids. There was nothing better than Grandma Arlene’s pancakes for breakfast at the cottage. She will also be remembered for her beef stew and carrot cake. As the kids grew older Arlene took a job with Grand Rapids Public Schools at the Northeast Junior High cafeteria. She enjoyed her job and the ladies that she worked with. Arlene loved to play bridge, any chance she could. As their health declined Arlene and Fred were given excellent care by the kind staff at Rest Haven Home. Arlene passed away on October 16, 2018. In Arlene’s memory, the family asks that you plant a flower, rescue a puppy, or be kind to a stranger.